As long as the topic of electoral-college reform has come up, what about a district allocation plan? I have not attempted to look at what it would have meant in 2016, but from what we can surmise from past elections, it would have tended to favor the Republican candidate in a close election. Presumably this one, too. One of the proposals sometimes mooted (by disaffected Democrats) is that electoral votes should be allotted proportionally within each state according to the popular vote. Obviously, since Clinton won the popular vote, she would then win the election! Not so fast. Let’s run the numbers. There are several different formulae to calculate proportional representation. D’Hondt is quite favorable to big parties; Ste. Laguë is quite favorable to small parties. Ste. Laguë: Clinton 264, Trump 262, Johnson 10, Stein 1, McMullin 1. D’Hondt: Clinton 267, Trump 267, Johnson 2, Stein 1, McMullin 1. In both cases, no one gets a majority. The race would then be thrown into the House, where each state delegation would get one vote. Since Republicans hold majorities in 31 state delegations, Trump would almost certainly be elected president. Of course, this assumes that no voters changed their votes, but of course small parties would almost certainly get more votes under this system. What that would do is make it very, very hard for either big party to get 270 EVs. Almost every election would be thrown into the House, where the Republicans hold a structural advantage in state delegations due to their popularity in rural America (read: small states). In other words, this reform would make it much harder for the Democrats to win the presidency. In recent weeks there has been considerable attention to proposals by some Republican politicians to change the allocation of presidential electoral votes from statewide winner-take-all to congressional districts–at least in states where doing so would help Republicans. If this method had been used for all electoral votes in presidential contests from 1968 to 2008, what would its impact have been? I happen to have district-level presidential votes for each of these elections (but not, yet, for 2012*). The graph below plots both the actual and hypothetical** electoral vote percentages for each party against the popular vote. Red for Republican, blue for Democrat. The solid symbols indicate the actual percentage of electoral votes obtained, while the open symbols indicate the hypothetical allocation by congressional district. The plotted curves are local regression (lowess) curves for each party under each condition (solid for actual, dashed for hypothetical). The exercise shows how any discussion of shifting to this method of allocation should be talked about for what it is: a GOP-biased proposal. Note that, under the actual allocation, the two curves are close to one another, at least through the part of the graph where it really matters–the relatively close elections. There does appear to be a slight Republican bias in the actual method, as that party’s line crosses over 50% of the electoral votes at almost exactly 50% of the (two-party) popular vote, while the curve for Democrats crosses over at just over 50% of the popular vote. In other words, the data plot predicts the Democrat needs a bigger vote lead to get the electoral vote majority. But the effect appears very small, consistent with what Thomas, King, Gelman, and Katz find. However, under the hypothetical congressional-district allocation, there is a clear Republican bias. 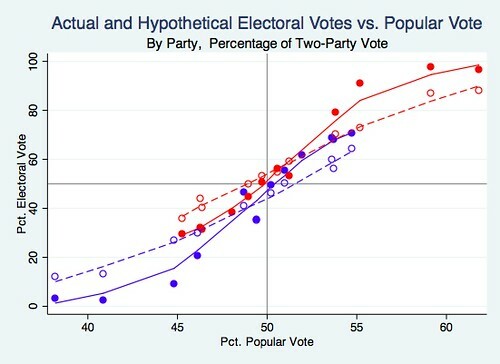 The Republican curve crosses over 50% of the electoral vote well to the left of the 50% popular-vote line, while that for Democrats does not break over 50% of the electoral vote until the party has a clear majority of the popular (two-party) vote. Only in the case of landslides in the popular vote does the congressional-district method result in greater “proportionality”, as indicated by the flatter curve for congressional-district allocation. Otherwise, there is no sense in which the Republican proposal is “proportional“; rather, it is a partisan power grab. It is a power grab especially when employed only in states where the Republican candidate tends to have a better geographical spread of the votes in the state; it is a power grab even if employed for all electors, as assumed in the hypothetical allocations shown here. Of course, an objection to any simulation such as this is that we do not know how campaign strategy might have changed under different rules. That is certainly true; if each House district actually would have awarded an electoral vote, campaigns would have targeted the marginal districts, some of which would have swung the other way. In other words, the votes themselves could have been different. We can get a broad understanding of the opportunities for potentially swinging electoral votes by considering how often a district is marginal in the presidential contest. There are 4,782 observations. **** There have been 730 the entire time that were decided by less than 5 percentage points (15.26%). Obviously, 1976 could have been swung by district-focused campaigning: there were many more close districts than the margin (two electors!) that Carter would have won by under a district-based allocation. Not surprisingly, 2000 is another year when districts within the margin of 5% outnumbered the overall electoral-vote margin under the hypothetical allocation. In 2008 there are as many close districts as the electoral-vote margin, and in 1992 the two figures are within a few districts of one another. Looking only at these four elections, we can see which party had the greater number of marginal district wins. This suggests that Bush’s district-based win in 2000 would have been relatively secure, as he had fewer close races to defend against the Gore campaign’s (hypothetical) district-swing efforts. And there would have been little risk of the Republican swinging the 1992 or 2008 outcome, though the Republican could have made the race closer. But 1976 really would have been a complete toss-up, depending on how various individual district contests turned out. We might think that the candidate who trails in the popular vote would have more marginal districts to defend, but this is not true in either 1992 or 2000. All in all, it is clear that congressional-district allocation of electors benefits one party more than the other, and that in a close election, the Republican candidate would be likely to have an advantage. The Republican might even be able to win with less than 49% of the two-party vote. It is easy to see why Republicans might like a district-based electoral college. It is much harder to see why anyone would think it was a democratic (small or large d) improvement over the current method, bad though that may be. I am actually somewhat happy that some Republicans have opened the issue of electoral-vote allocation. The country needs this conversation. However, what it needs is not one party pushing a plan that would be blatantly distorting in its favor. It needs the Democrats to engage the conversation, and come out in favor of the National Popular Vote plan, which would remove partisan bias from presidential elections. * See sixth comment, below. ** As is standard for such proposals, I assume that the winner of the statewide plurality of the popular vote would be awarded two electors, in addition to a number corresponding to the number of individual House districts won. Two small states, Maine and Nebraska, are the only two states to have used such an allocation in at least some of the years analyzed. *** Andrew Gelman suggests that Romney might have won, given the “huge” distortion of congressional-district allocation. **** Would be 435*11=4,785, if not for the missing districts. What is “proportional” about robbing a majority winner of his majority? The LA Times refers today (Jan. 27) to Republican proposals in several states to replace statewide winner-take-all allocation of presidential electors with “a proportional system”. These proposals are NOT proportional; they are still winner-take-all, but in each congressional district. As noted elsewhere in the article, had a district plan been in effect in 2012 Mitt Romney might have won 9 of Virginia’s 13 electors. This means Barack Obama, who won 51.2% of the statewide vote, would have had barely 30% of the electors! This does not meet any standard of proportionality. Even the House of Representatives, which is obviously allocated based on congressional districts, is not proportional: Democrats won the most House votes in 2012, but Republicans won a majority of seats. Proportional representation is used by most of the world’s democracies. It produces allocations of political power that mirror how people actually vote. By contrast, the Republicans are proposing a house of mirrors to distort the vote for partisan advantage. The Wall Street Journal has an article about the progress of the National Popular Vote compact, which in turn is being discussed at FiveThirtyEight (whose name would be rendered quaint if NPV passes). Given that the most likely ‘split’ scenarios continue to favor the Democratic candidate in the electoral vote, I suppose Democrats are now fairly relieved that Amendment 36 did not pass.